The idea can conjure up images of dread for some parents. Piles of soaking wet clothes. Boots caked in mud. Tiny dirt handprints all over your car. As you buckle giggling children with dirty faces into car seats, you think about how you can quickly clean up the mess. Wash up those dirty little faces. Get the clothes into the laundry. Hose off the boots. Scrub off the handprints. Take a second to pause before you clean up all the good. Look past the mess. There are many wonderful benefits to letting your children step into puddles and jump into the mud every once in awhile. First of all, remember that it’s just plain fun for your kids. They get to break the rules, let loose and play. It brings them joy and teaches them proper outlets for their energy and stress. Remember that play is more than just fun … it’s how they practice important skills to prepare them for adulthood. Each jump and splash develops their motor skills so one day they can run off to start their own adventures. Think of your children’s immune system as potential skills, like painting. Every child has the ability to be a painter. But only those who have the opportunity to start small, paint a few simple objects and develop their skill over time learn to be artists. In the same way an artist practices their brush strokes, mixes colors and practices their art, children need to build their immune system. They need to fight germs with a fever, throw up to rid their stomachs of harmful contaminants and cough to remove germs trapped in their phlegm in their airways. Think of each jump in the puddle as a chance for your child to grow. A chance for their legs to get stronger. An opportunity for their brains to learn coordination. A chance for their bodies to learn to fight off the germs in their own backyards. Look past the mess for a few minutes, and think of the potential for their bodies to thrive. National Step in a Puddle and Splash Your Friends Day is January 16, and what a great time to get out and build strong, healthy bodies! 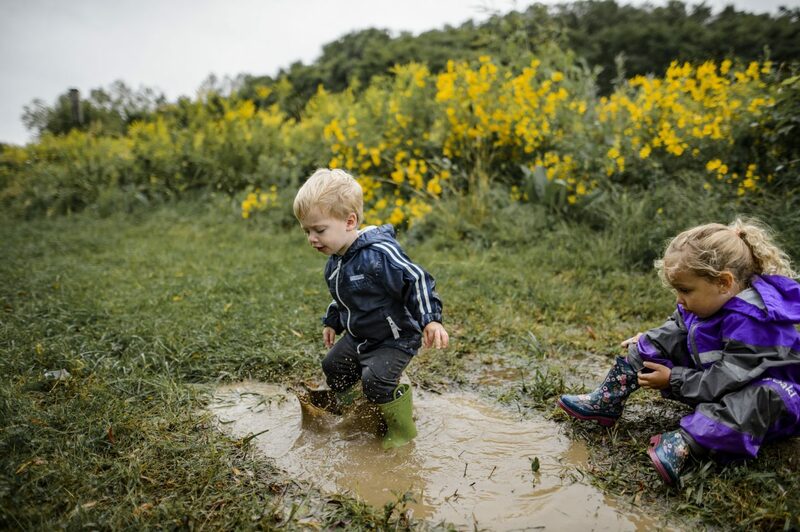 Check out our calendar for a great puddle-jumping hike near you or add your own! Let your kids give their friends a little mud splash and build their immune system (and have fun!). Then pull out the hose and start the laundry as soon as you get home. How will you celebrate National Step in a Puddle Day? Share with us in the comments below. This post is sponsored by Merrell. Off Trail healthy kids on trail, puddle jumping. permalink. Hiker, mom, babywearing educator, and cat lady.